Whether you have a newborn, toddler or teenager there is one thing that is a challenge for most: Patience. I hear it a lot from moms and I’ve said it many times myself, “I want to be more patient with her, but she just drives me nuts sometimes.” First, let me say that if this thought has run through your mind, it means you are human! It is perfectly normal to feel frustration, irritation, impatience, annoyance, anger, etc. All of those negative emotions are just part of the human experience. However, there are a few things you can do to feel those negative emotions a little less while raising your amazing kids. 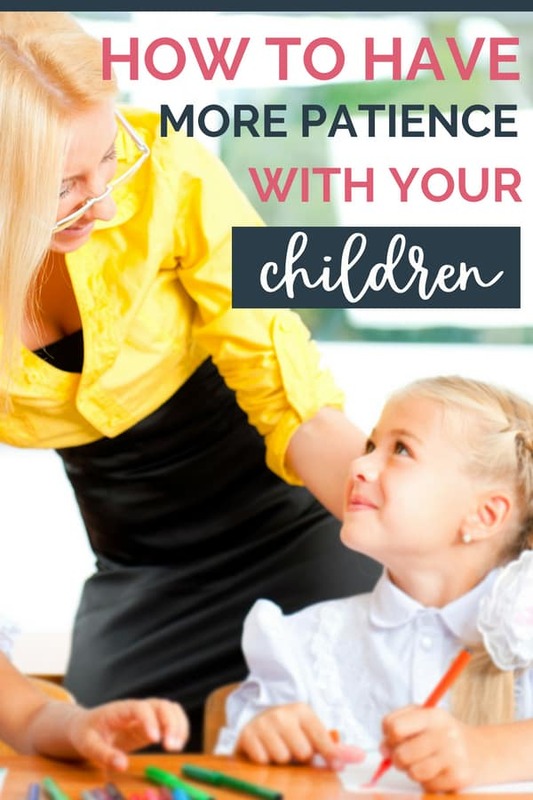 So, here are 4 Ways to Feel More Patience with Your Kids. Let’s say you buy a new phone. You may skim through the manual or you may not. Either way, you have expectations for how your phone should work. It should not randomly reboot in the middle of your browsing session. It should not get stuck on the same page. It should not drop a call. You get the picture. Well, we have these same types of manuals for other people in our lives and most of the time they aren’t even aware of them. The manual for your husband may say that he is supposed to see you could use some help and help without you having to ask. The manual for your mother-in-law might indicate that she is supposed to be respectful and in agreement with how you want to raise your children. You get the idea. We also have one of these manuals for our kids. I know the manual for my daughter is that she should not be moody. She shouldn’t speak to me in a disrespectful tone. She should want to spend time with me instead of her friends. When she was a toddler, I had the expectation that she shouldn’t spill things, forget to brush her teeth or clean up her room. The problem with having a manual for how others should and shouldn’t behave is that it only causes US more frustration, irritation, and suffering. Try throwing out or burning your manual for your children and see what happens. I know for me, I showed up as a much more relaxed, patient and pleasant mother to be around. Take a timeout: Let your kids know that Mommy needs a timeout, and they are not allowed to bother her for the next 10 minutes. My daughter is 13 now, but let me give you an example of how this works. I pick up my daughter from school and she is in a not-so-good mood. I ask how her day is and of course, I am met with “fine” followed by a request to stop at Subway (in a really nasty tone). Then I take a few deep breaths and I don’t say anything for the next 5 minutes. As I do this, I can feel the irritation subsiding as I keep reminding myself that nothing has gone wrong here. She is acting exactly how hormonal teenagers act. Now, that doesn’t mean I let her get away with speaking in a disrespectful tone. Once the irritation subsided, I let her know that even when she is having a bad day, it isn’t ok for her to speak in a disrespectful tone. She apologized with the utmost sincerity and all was good in motherhood. I know what you may be thinking. How is journaling going to help me have more patience with my kids? Think of it as your sacred ground. Sometimes just getting our thoughts on paper can create a totally different feeling….a more peaceful feeling. It may not seem like writing about how frustrated you are with your 2-year-old because he keeps peeing in his underwear after you thought he was getting this whole potty training thing would help you to feel more peace, but it does. It helps to get the negative thoughts out of your head and on paper so you can think more clearly and show up as the mom you want to be. Why is this a problem for me? What could be going on for him/her? When I feel ____, how am I showing up as a mom with my kid? What result is my action getting me? Is it the result that I want? This will bring you even more aware of what is going on in your brain. Our brain is an incredibly fascinating part of who we are and getting to know it better just makes life easier. 1. Find a form of exercise that works for you and your lifestyle. Maybe it’s 30 minutes at the gym while you have someone watch your kids, or maybe it’s home workouts that you get your kids involved in. It could even be playing soccer in the yard, going for a walk in the park or taking a bike ride in the neighborhood. 2. Get as much sleep as you can. I know you are laughing at me right now and thinking, “Sleep? What is that?” Yes, when you have little, you will be somewhat sleep deprived and that’s expected. The key is to take advantage of every opportunity you do have to get some sleep. Is your kid napping? Don’t go do laundry, watch Netflix or scroll through Facebook. Take a nap. It’s very tempting to do these other things so we can “get things done” or escape from motherhood for a bit, but a nap will be so much more useful for you in the end. 3. Make healthier food choices. The better the nutrients you feed your body for fuel, the more energy you will have. Diet Coke, chocolate, and coffee loaded with sugar seem like they help when you just can’t get going, but they only help in the short term. If you want energy that will last all day, go with the water, apples dipped in nut butter and a hearty salad. Your body will thank you and you won’t feel so “hangry” and impatient later because your blood sugar won’t be crashing. 4. Do something you love. It doesn’t have to be an all-day affair. Just pick one thing that you really enjoy doing and schedule it into your week. Even if it’s only 10 minutes, it will be refreshing for your soul. I want to challenge you to try each of these steps above and tell me how it goes! Leave a comment. Tell me what was challenging for you about this and if it was helpful for you. I’d love your feedback. If you need extra help with Mom life, Sign up for a free 30-minute mini coaching session with me and let me help you!